1. A request for visit to Rashtrapati Bhavan can be made by On-line Booking system through a link on the website 'presidentofindia.nic.in'. 2. 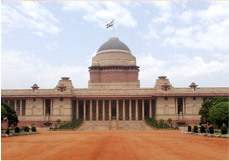 The visiting days of Rashtrapati Bhavan and Mughal Gardens are Friday, Saturday and Sunday. Rashtrapati Bhavan is not open for visitors from Monday to Thursday and on Govt. Gazetted holidays. 3. Timings of visit are from 0900 hrs to 1600 hrs. 4. Entry to Rashtrapati Bhavan for visit is through Gate No.2 (Rajpath) and Gate No.37 (via Dalhousie Road) of Rashtrapati Bhavan. 6. Registration charges of Rs. 25/- per visitor is introduced w.e.f. 1st September 2013. The registration charges are payable online and will be non-refundable and non-transferable. 7. Visitors below the age of 12 years will be exempted from the registration charges. Visitors individually or in a group of less than 30 persons will be charged @Rs25/- per visitor per visit. Visitors in a group of 30 persons will be charged Rs. 600/- in lump sum per visit. Visitors in a group of more than 30 persons will be charged Rs. 600/- for 30 visitors and Rs. 25/- per visitor per visit for additional persons. 8. Online booking is subject to confirmation through email / sms. 10. The permission to visit Rashtrapati Bhavan and Mughal Gardens is subject to cancellation, if circumstances render it necessary.